Just back from a very enjoyable visit to Southern Evangelical Seminary, where I gave a lecture last night on classical theism. Many thanks to the very kind folks at SES for their hospitality. 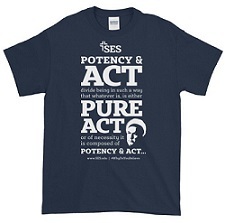 And thanks also for what is probably the best T-shirt I’ve ever seen – SES’s Act and Potency T-shirt, emblazoned with an image of Aquinas together with the first of the Twenty-Four Thomistic Theses. You can pick one up via the SES store website, where I see they also have a matching Act and Potency coffee mug and Act and Potency poster. Amaze your friends, or at least baffle them! Will this talk be available on the web? Man, I just realized The Last Superstition was published like 10 years ago. Just want to thank you for all your work, dr. Feser. Reading "The Last Superstition" was a very powerful experience for me ("Aquinas" too); it was the first time I could actually say "a-ha, now I understand what Aquinas is all about!". I already had some knowledge of thomism and some grasp of concepts like essence and so on, but in my head it was still fairly obscure and confused. I had read a little bit of the ST and some commentary -- some of the 24 theses, some stuff by Lagrange, etc. But everything was still fairly difficult for me to understand, as I didn't have much experience with philosophy at the time. Your books were the ones that really did it for me -- you wrote clearly, explained each concept, and interacted with contemporary authors and issues. Finding your work has been a very happy event in my life. Thank you. It's my birthday tomorrow. I turn 50! Prof. Feser, Google and Wikipedia are telling me that you've just turned 50 this past Monday. Is that correct? Lesson learned. Check Feser's blog more often. SES is 1 mile from my house and I would l have thoroughly enjoyed going to this. Thank you Dr. Feser. I just ordered me one of those wonderful SES Aquinas Tee-Shirts. Very Cool. "You can never underestimate the taste of the American public"--or its ability to trivialize anything and everything. Absolutely no discernment of forms. Americans would be perfectly capable of serving the Bread and Wine in styrofoam cups, and have enthusiastically put Biblical characters and sacred events in comic books and in Hollywood movies. They incarnate the "swine" and the "dogs" mentalities. A heavy blanket of stupidity and ideological idiocy covers everything. Okay, so I bought one and wore it to exercise in a class with some other professors. Immediate reactions: (1) I was advertising for the ACT test (most common reading). (2) "Potency" had something to do with ability to impregnate, and why was I wearing that message? (3) I tried to explain the shirt, and eyes glazed over roughly ten seconds into the explanation. So, I really like the shirt, but no one else does.